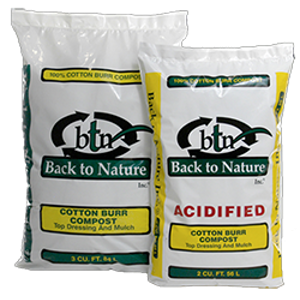 Back to Nature Cotton Burr Compost is truly nature's perfect soil conditioner. When properly composted, cotton burrs are an excellent food source for the beneficial soil organisms that help to make nutrients available to plants, aerate the soil, and help to keep harmful organisms and dieseases in check. Cotton Burr Compost has excellent mositure-retention characteristics and is prized for its ability to break up tight clay soils. Regular cotton burr compost helps to neutralize soil pH, and if additional acidification is needed, our acidified products contain sulfur, the longest lasting elemental acidifier.